We are now entering October, so what happened in the weather department during the month of September? Well, the biggest story is the abnormally warm temperatures we saw here in Rockford. One day saw temperatures soar into the lower 90's, which ended up being one of the four hottest days all summer. Numerous days featured high temperatures in the 80's. Most days in the month saw temperatures above average. Statistically, we were oh-so-close to breaking the record for the warmest average September temperature ever. The record highest average September temperature (utilizes both daily highs and lows) is 69.9°. Rockford's average temperature this year for the month of September is 69.4°. That number is good for being 5.3° above normal. Precipitation was roughly average for the month. Totals by the time the stats for September 30th come in will be at roughly 3". That will result in a month where we were about three-tenths of an inch below normal. It is certainly not abnormal to see a departure in the precipitation category. It is typical to see precipitation totals between 0" and 0.50" above or below normal. Therefore, September will go down as slightly below average in the rainfall department, but overall it has been roughly average. It's been dominating our weather pattern across the Midwest for the past week or so... yes I'm talking about that pesky upper level low pressure system. Its currently located over Kentucky this morning and that is why most of Thursday afternoon and evening remained dry. However, that low pressure is still forecast to retrograde this afternoon. That essentially means it will move from the east to the west, from Kentucky to northwest Indiana through the day. With that forecast track, the chance for rain will increase today, but especially for the evening. We can expect this afternoon to remain cloudy and windy, with northeast winds at 15mph and gusting to 25 mph. In terms of the rain, the Stateline looks to pick up on widely scattered lighter showers. For the afternoon, the highest coverage would be right around Lake Michigan with rain likely there today. For the Stateline, the highest coverage remains near our eastern counties with about a 40-50% chance. For areas closer to Rockford the chance drops a bit to 30-40%, and west of Freeport and Oregon the chance is dropped to about 10-20%. Rain threat decreases from east to west because of the movement of the low. Today the rain will move in from the east and then tracks west. The low is drawing in moisture from the Atlantic and at first it will be harder for western counties to receive that, along with the lift from the low also decreasing the further west you head. As mentioned though, tonight with the low almost overhead, the chance for rain really goes up, and turns likely for the entire area closer to midnight. The low is finally able to scoot northeast tomorrow and that will keep rain in the forecast through the mid-afternoon and then diminishes late in the day. We keep the clouds from the low on Sunday but we stay on the dry side, before warmth and more sun arrives on Monday of next week. It seems like a long time ago that we last saw thunderstorms here in the Stateline. That is because we have been under the influence of fall. That has led to cooler temperatures, low humidity, and a lack of a thunderstorm threat. That trend continues Friday as scattered showers are expected on the back side of an upper-level low that will be situated in Indiana. However, as the low approaches the Illinois border into Saturday, it will bring a slightly more thunderstorm-friendly air mass into the Rockford region. With the center of the low nearby, some minor instability (CAPE) will develop during the day. That is what thunderstorms need to develop and maintain themselves. Think of CAPE (Convective Available Potential Energy) as food for storms. For the Stateline, there will be minor CAPE in place Saturday. That, in addition to having the upper-level low so close, will support an environment slightly more conducive to thunderstorms than what we have seen lately. It is not a guarantee by any stretch of the imagination that we see thunder and lightning. But the formula for storms will be more complete than it has of late. The good news is that if we do see a thunderstorm or two, it won't be severe. An astronomical event will occur this Friday, the last day of September. The catch? It's essentially invisible. So, what is the point of even mentioning this phenomenon? It is referred to as a "black moon" and has not occurred since March of 2014. It usually happens roughly once every other year. So it's not exactly ultra rare, but it isn't an every year type of happening. The "black moon" title is used whenever a second new moon phase happens in a single calendar month. That will happen for the western hemisphere this Friday. A new moon is the phase when the illuminated side of the moon faces away from the earth. Therefore, no moon is seen because there's nothing to light the side of the moon that is facing earth up. This phase is normal and occurs in every moon cycle. This particular event is only given a special name because it doesn't happen all the time. The first new moon of the month went completely unmentioned. The one effect this event will have on areas where sky cover is not a limiting factor is it will provide a very dark sky (no moonlight to illuminate the sky). That darkness will supply ideal stargazing conditions. The sad news for the Stateline is extensive cloudiness is anticipated to be in place, as are a few showers. Thus, not only can we not see a "black moon," but we won't be able to see its effects on stargazing. Today's temperatures ranged from the upper 50's into the lower 60's. Some locations did surpass the pictured range of 58-62°, but that does not change the fact that today featured the coolest high temperatures since May 15th! We can thank the enhanced cloud cover, showers, and north winds for putting a "cap" on our temperatures today. This was one of those days typically thought of as "raw." We are already seeing clearing this evening, but addition rain is likely through midnight with a band of rain moving inland from Lake Michigan. The area of low pressure responsible for the showers and rain will move far enough east on Thursday to deliver a mainly dry day with warmer temperatures near 70°. However, the same low will meander back west towards Indiana on Friday and Saturday, As a result, we will see a return to "raw" conditions with showers, clouds, winds, and temperatures only in the middle 60's to begin the weekend. Buckle up! Fall is definitely here to stay! A very pesky "cut-off" low has been swirling in place on the northern shore of Lake Superior for the last 48 hours. It is the same low that swung the cold front through our region late Sunday. The low has kept low clouds, showers, gusty winds, and cool temperatures in place just to our north since Sunday. Although it hasn't moved much at all since Sunday, it will slowly drop south towards the Illinois-Indiana border Tuesday night and Wednesday. That will result in showery, cloudy, and cool weather for the Stateline through Wednesday evening. The low will then slowly move into Ohio, taking the shower activity with it -- only for 24 hours, though. As the low area of low pressure sits in the Ohio Valley Wednesday night and Thursday, it will be far enough away to allow for a partly cloudy and milder day Thursday. Temperatures should be able to warm into the lower 70's, but the winds will remain breezy. The break in cloudiness doesn't last, however. The low pressure center will meander back westward into Indiana Friday and Saturday. That will bring back the chance of a few showers. The low will edge away from the region late Saturday, which will bring an end to the extensive cloudiness, windiness, and showery weather for Sunday, Monday and Tuesday! Despite fall entering with a force today in the form of sunshine, strong winds, and temperatures in the 60's, September has been remarkably warm. In fact, we are currently on track to break the record for the warmest average temperature in the month of September. Of the 26 days that have come and gone, 20 of them were above average. That is good for 77% of September days being above average thus far. Not only that, but our average high temperature for the month is a little higher than 81°. That is a degree warmer than our average high on the first of the month, or the warmest day of the month. Now let's jump back to the whole, "we could be in for the warmest September ever" statement. If the month ended today, we would break the record for warmest average September temperature by over 1°. To get the average temperature for the month, each day's high temperature and low temperature are taken into consideration. Once all of the data are attained, an average is taken. Of course there are still four more days in the month to get through. Each of those days is expected to feature high temperatures in the 60's and low temperatures near 50°. Thus, we could slip just below that 69.9° threshold by September 30th. It'll be something to watch for the next 96 hours! Big changes this week! If you've been chomping at the bit to get out and visit one of the many apple orchards or pumpkin patches, this week is a perfect week to do it! If you spent the day outside yesterday, it had a very summer like feel with highs in the mid and upper 80's (for most) along with fairly muggy conditions. However, a potent cold front that brought scattered storms yesterday afternoon and a few showers overnight is now well to the east of the state. Now our dew points are falling into the 40's along with plenty of sunshine. It will be a very dry day today, albeit windy and very fall-like. Winds will gust from the west up to 35 mph today as temperatures make it to about 66°. Compared to yesterday, that is a 20° temperature drop in about 24 hours. Not only that, but the week as a whole will be vastly different. The average high temperature last week was in the 80's compared to this week's forecast average high which is in the 60's. If the forecast pans out, the weekly high will be about 15 degrees cooler. A deep low pressure system will then sink south over Lake Michigan, dislodging much cooler air with a deep trough over the Midwest and into even the mid-south. Temperatures will only reach near 60° on Wednesday before rebounding back into the low 70's through the weekend. Very high fire danger today for field fires, for areas along and south of Highway 30. These areas have the best conditions for cropland fires growing rapidly. For the Stateline, this includes Whiteside County, while the rest of the area has more of a limited fire risk. This happens as the relative humidity drops to about 30-35%, which essentially is a very dry air mass. We combine this with strong westerly winds that will increase and become sustained from 5-15mph to then 15-25 mph, and then gusting to 35 mph. With these combined conditions and now harvested fields it will make for a high fire danger. If an agricultural field were to catch fire, the weather conditions would support it spreading quickly. For those of you that have been waiting for fall-like temperatures - they are on their way! The storm system that is pushing though our area this evening has the first true fall-level temperatures behind it - this is the same storm that dropped snow earlier this week in the Rocky Mountains. Even though we had very warm air in front of the storm and humidity that made it feel like a summer day, big changes are on the way. As the above graphic shows, temperatures for the majority of the upcoming week will be below normal for a change. The normal high for today is 71 degrees and by the end of the week, the normal high will have dropped to 69 degrees - big changes for this time of year! In addition to a big drop in temperatures on Monday, winds will be very strong as well - running 15 to 25 miles per hour from the west with some gusts over 30 mph - welcome Fall! The Climate Prediction Center is still predicting a warmer-than-average fall for the Stateline area, so even though the cool temperatures may give way to above average temperatures in the future, it will be a refreshing change to the recent warm and humid conditions. Have a great start to your week! Stormy Weather On The Way! Big changes on the way tomorrow as a storm system approaches from the west bringing us increasing chances for rain and thunderstorms. This is the same storm that is bringing snow to some rocky mountain areas - so you know there is some colder air behind it. We have a very mild night in store tonight as dew points are high and we will have increasing clouds, all having the effect of holding heat at the surface. Our low will be 65 degrees - very mild on a night when our average low should be 49! Tomorrow morning a warm front will push through, raising our temperatures and increasing dew points even further, in fact by afternoon our dew points could feel almost tropical at 70 degrees. A cold front will approach from the west and should move through the Stateline area around 6 or 7 pm, bringing the best chance for showers and thunderstorms. Some of these storms could be severe (marginal risk only) with high winds and moderate hail being the greatest threats. Big changes on Monday with much cooler air in place, a possible shower and a high of only 66 degrees with a low of 45 degrees Monday night - downright cold! It will finally start to feel like fall. September has been quite warm thus far. In fact, we are flirting with the warmest average overall temperature ever for the month of September. There is one road block in the way that may disallow Rockford to record its warmest September ever, however. That is a large upper-level trough that is poised to move across the Midwest and Great Lakes early next week. That trough will be associated with a powerful early fall cold front that is going to move through late Sunday. The map above shows that trough (a dip in the flow) by looking thousands of feet into the atmosphere. The shades of green and yellow indicate much cooler air, and that will be around through the entire week. This may be the cold front that fully eliminates summer-like heat and humidity from the forecast until 2017. Take a look at the graphic depicting our temperature trend into next week. We will be above average in the upper 70's and lower 80's this weekend, but highs will only be in the 60's and lower 70's next week with plenty of sunshine. While there's been more dry days through the month compared to wet ones, Rockford and other Stateline areas have received decent amounts of rain. There have been two days in where Rockford alone received over an inch of rain. Typically the month receives about 2.50" of rain, but already the month's total has added up to just under 3 inches. And, there's more rain in the forecast coming up by the end of the weekend with a potent cold front posed to arrive Sunday afternoon. Along with the rain, its been a fairly warm month as well. So far its one of the warmest Septembers on record, but we'll have to wait until the end of the month to see exactly where we rank. As it stands now, the monthly average (average of the daily high and low all month) has reached almost 71° which is 5° above the monthly average. Temperatures next week however will fall into the 60's through Wednesday. Fall is Here; What is Next? Fall is officially here. So what does that mean for us? First and most importantly, it's a sign that cooler temperatures are on their way. Another noteworthy piece of information about our change of seasons is the fact that we have and will continue losing daylight at roughly three minutes per day through late October. Once November arrives, our rate of losing daylight slows until we reach our shortest day of the year, which is the winter solstice in late December. We are also going to begin noticing fall foliage occurring in northern Illinois and southern Wisconsin. As temperatures continue their decline, the leaves will begin to change color. For the Rockford area, the best viewing time for fall color occurs between October 3rd and November 6th. So we know what fall means in a generic fashion, but what kind of weather are we actually anticipating to occur? According to the latest trends, nearly all of the lower 48 has a chance of seeing above average temperatures through fall. It is unusual, but there are no locations in the United States where below average temperatures are expected. That does not mean there won't be cool stretches spread out through the fall season, but the overall pattern looks to feature warmer than average temperatures. That will especially be true for the southwestern portion of the country. Regarding precipitation, forecast guidance suggests that much of the United States has an equal chance of below or above average rainfall through the fall months. The southeastern United States has a moderate probability of seeing below average precipitation. Only Montana sees an above average chance of seeing more rain than normal through December. The autumnal equinox will occur tomorrow, September 22nd. We all know that means fall officially begins (at 9:21am to be exact), but what else does that phrase mean? The word "equinox" is derived from Latin. In Latin, the prefix "equi" means equal, and the word "nox" means night. Putting these two together results in a word that literally means "equal night." And, if equal night occurs, equal daytime would automatically occur as well. In other words, the autumnal equinox is a day that features essentially equal daylight and nighttime for both the northern and southern hemispheres. The reasoning for the equality is simple: the sun's rays hit directly at the equator, which leads to 12 hours of daylight and 12 hours of nighttime. It's important to know, though, that it is not exactly 12 hours of each, but it is very, very close. The autumnal equinox always occurs in late September in the northern hemisphere. Once we pass the 22nd, we will start to lose daylight each day through the winter solstice, which occurs in late December. That day features the northern hemisphere's shortest day in terms of daylight of the entire calendar year. Storms with heavy rain and dime to nickel sized hail have continued south across the Stateline this morning. Not one, but two lines of storms have moved through. So far there hasn't been any severe storms, but there has still been hefty amounts of rain. So far some locations have picked up around an inch and a half of rain, with more rain still falling. Along with that, there have been wind gusts around 40mph and hail up to a half inch in some of the storms. The storms will continue sinking to the southeast around 30 mph and will continue through about 1pm today before we see dry but cloudy skies across the area. These storms have developed where there has been higher moisture levels and higher instability. As mentioned, no severe weather is anticipated at this time, but storms will continue with heavy rain, small hail, and gusty winds near 40mph. The stronger areas of storms will continue to sink southeast and stay mainly south and west of Rochelle. Coverage of these storms will lessen by the afternoon and we begin to dry out. 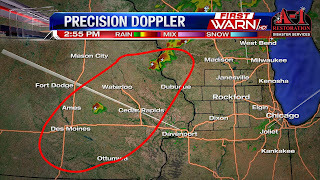 While there are storm chances tonight, I anticipate they will stay north of the Wisconsin Stateline. The jet stream will shift well to the north for the remainder of the week and into the weekend. That is important for our neck of the woods for two reasons. First, since we will be located to the south of the jet -- which is just an area of very strong winds within the flow up in the atmosphere -- we will see southerly winds. It is winds from the south that usher in unseasonably warm temperatures during this time of year. In terms of the magnitude of the heat, we won't see record highs. But middle and even upper 80's have occurred already this week, and will likely occur again. The humidity will also be abnormally high for this time of year through the weekend to accompany the hotter temperatures. The second impact that the jet stream's location will have on the Stateline is it places the region in a spot where rain and storms will likely occur multiple times. In these types of patterns, wherever the apex (top of the ridge, or jet stream arrows in the image above) is located usually represents the area where rounds of rain and storms will happen. That area will be Wisconsin, southern Minnesota, Iowa, and potentially northwest Illinois through the rest of the week. These rounds of storms usually develop in the evening and use a nocturnal low-level jet stream, ample moisture, and warmth to maintain themselves through the nighttime hours. As meteorologists often say, "they round the ridge." That phrase refers to the areas of storms that develop. Once they do form, they usually congeal into a line and push southeast rapidly -- following the winds of the jet stream aloft. With the jet being just to our north this week, the locations with the best chance of seeing these lines of storms -- or MCS's -- will be Minnesota, northern Iowa, the eastern Dakotas, and Wisconsin. However, as is usually the case with these patterns, the MCS's will tend to have enough strength to push further south than forecast models suggest. That is why there is a chance that we could see some of these nighttime storms reach the region both Tuesday night and Wednesday night. Where Did Our Storms Go? Conditions appeared supportive of severe weather today across northern Illinois and southern Wisconsin. A severe thunderstorm watch and a tornado watch were issued late in the afternoon for areas north and west of the region. Our counties in southern Wisconsin, in addition to Jo Daviess County were included in a watch. However, there was only one severe weather warning that was issued through the evening. That was far less than what was expected. So, why did we see a low amount of thunderstorm activity? The corridor of severe weather supportive parameters was very small. Southern Wisconsin and the eastern half of Iowa had the necessary ingredients to see severe weather. Those are the locations that witnessed a few severe thunderstorms. Areas such as Galena, Savanna, Freeport, Janesville, Monroe, and Sterling were on the fringe of the "best" area to see severe weather. The moisture content, instability, and wind shear were all much higher than those same parameters in Rockford, Belvidere, DeKalb, Sycamore, Rochelle, Oregon, Byron, and Amboy. It's not very common to see such a difference in atmospheric profiles in such a small area. 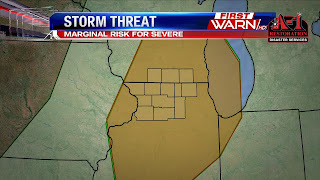 Since the parameters were not in place over much of northern Illinois, the thunderstorms died as they approached the Illinois-Wisconsin border Monday evening. Not only did much of the Stateline lack instability, shear, and moisture, but there was an atmospheric "cap" in place aloft. In other words, a warm layer existed thousands of feet off of Earth's surface. That warm layer results in what is referred to as a stable environment. Thunderstorms do not like stable environments. Thus, as storms approached northern Illinois (aside from Jo Daviess and northern Stephenson Counties) they quickly faded, essentially approaching a wall of dry air. 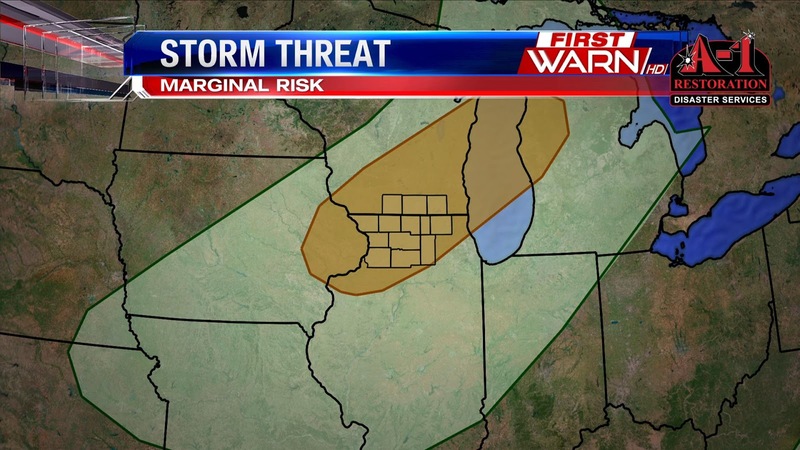 We are monitoring the weather closely this afternoon as severe weather is likely across portions of the Stateline. The radar is beginning to show signs of what is to come this evening. In Iowa, which is where the storms will initially develop, a storm ha already developed and strengthened rapidly. That trend will continue in the red oval through the remainder of the afternoon and evening. Storms will strengthen very fast; many will turn strong to severe. 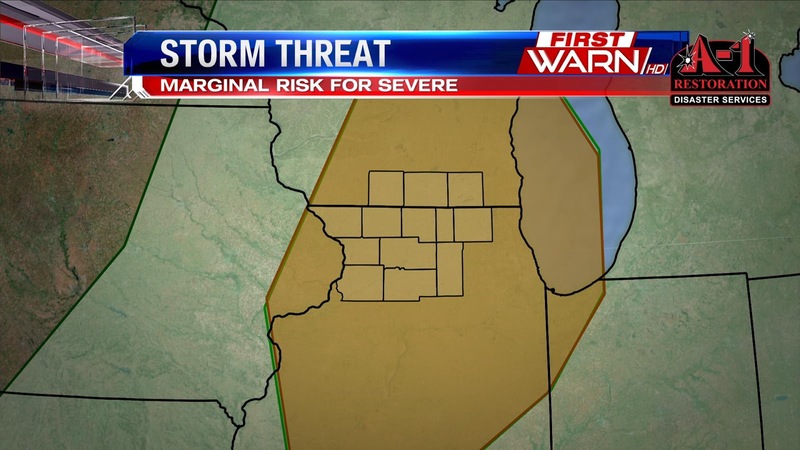 A Severe Thunderstorm Watch is already in effect for Walworth, Green and Rock Counties in southern Wisconsin until 8 PM. A Tornado Watch is likely to be issued by 4 PM for eastern Iowa and far northwestern Illinois. That is in anticipation of severe thunderstorms developing and posing a large hail risk and an isolated tornado risk across east-central Iowa into the northwest corner of Illinois. 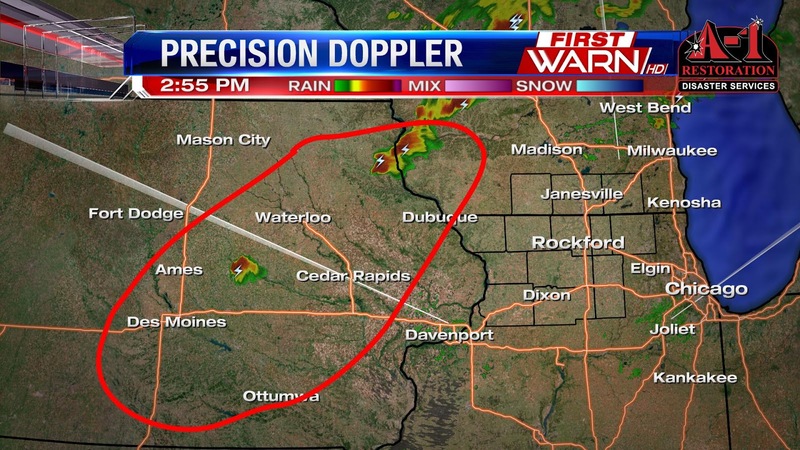 The timing will likely be after 5 PM for southern Wisconsin and far northwest Illinois (Jo Daviess County). It's important to remember that just because no watch is out for your particular county does not mean there is no severe threat. 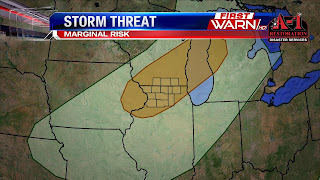 There is a risk of severe thunderstorms for the entire area, but the highest threat exists in southern Wisconsin, Jo Daviess, Stephenson, Carroll, and Whiteside Counties. Other locations could see a strong or severe thunderstorm as well through the evening, but the threat is lower due to less favorable severe weather parameters. Be sure to follow our Twitter and Facebook pages for updates! Most of Monday looks to be a gorgeous summer-like day with breezy southwest winds and high temperatures in the mid 80's. Most of the afternoon won't be very humid, but late in the afternoon we will notice more humidity arriving ahead of our next storm system. The heat and higher dew points will then set the stage for strong to severe storms late this afternoon. With the heating of the day, instability will increase and an incoming cold front will help to fire up isolated to widely scattered storms in the area. Storms will initially develop northwest of the Stateline in central Wisconsin and north central Iowa, with storms then moving southeast. Initially storms will be super cellular in nature, with threats of heavy rain, strong winds, large hail, and even a couple of tornadoes. As the storms move away from the front, they lose the support of the extra lift and instability and I believe will weaken as they move into northern Illinois. By this time the tornado threat will be lower, the Stateline looks to see more of a large hail and heavy rain threat, along with gusty winds. As the forecast stands now, storms won't be moving terribly fast either. Timing for the Stateline will be around 4pm through about midnight and then drying out overnight. We will continue to keep you updated as we go through the day. What a spectacular weekend - seasonably warm temperatures, lower humidities and almost unlimited sunshine - a nice way to move into the fall season indeed. Changes are in the offing however as a storm system approaches us from the Northwest on Monday. As the storm system is approaching - our winds have turned to the South and will usher in higher temperatures and humidity as well on Monday. These to factors will increase the instability of the airmass. As the cold front associated with the storm approaches, the forcing from the front could trigger formation of some storms, some of which could become severe. 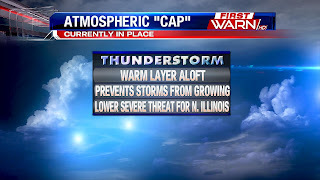 It doesn't look like this will be a widespread event as there is an atmospheric cap in place and could prevent the storms from growing to severe size. 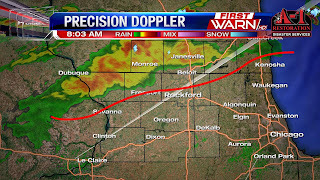 Timing on arrival of the front and the associated storms will need to be watched. Based on models reviewed tonight, it looks like the timing will be 8 or 9 pm tomorrow. Sometimes storms can be triggered before the front arrives as well, so stay in touch with us and we'll keep you updated. After the front passes on Monday, Tuesday looks to be another beautiful day. Have a great night! Next week will feel more like a summer week as opposed to the opening of fall. This is because the jet stream is going to push well to our north and introduce a strong southerly flow and higher humidity. Our average high this time of year should be 76 degrees, but we will be above that number the entire week, with highs especially toward the end of the week in the low to mid-80's. Big changes are in store however as the jet stream next Sunday will dig well to the south, ushering much cooler and drier Canadian air and it looks as though this weather regime could be in place for a good portion of that week. The timing would almost be right on target, however as the first day of Fall is this Thursday. So it will begin to feel like fall - just 4 days later! Enjoy the summer-like week ahead! Showers and thunderstorms moved through the Stateline area earlier today as a disturbance pushed through - the good news is that most of the rain activity has pushed off to the south and east and should allow most of the football games this evening go without a hitch. This is especially important because of all the cookouts and tailgating tonight. 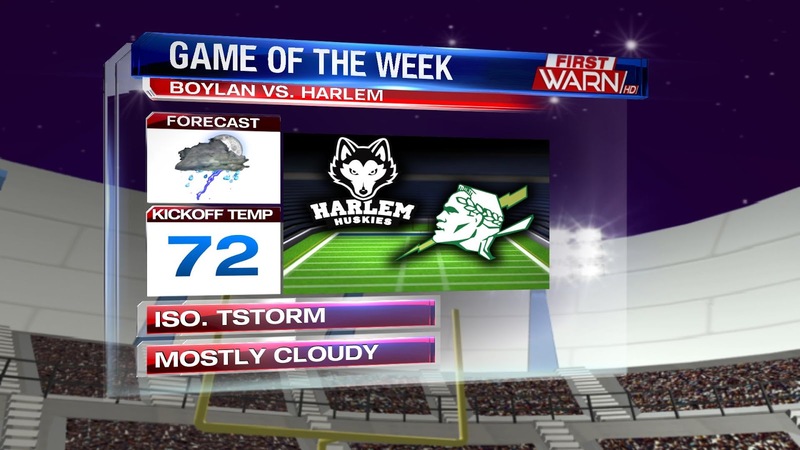 The game of the week is Boylan vs. Harlem and should be a great game with very comfortable conditions. The temperature will be 72 degrees at kickoff and their is just a slight chance of a shower before the game is complete. It will continue to be mild tonight with a low of 65 degrees. Tomorrow morning we will have elevated chances for showers and even a thunderstorm as a cold front approaches from the west. After any early morning showers, our skies should clear and it should be another great day for football - or whatever else you might have planned! Models have continued to show warm temperatures next week across the Midwest and Great Lakes. Upper-level ridging is expected to take place Sunday into Monday, which will be accompanied by southerly flow. That will usher warm air all the way into the Dakotas and Minnesota early in the week. That warm air will reach northern Illinois and southern Wisconsin by Monday in the form of high temperatures in the lower 80's, which would put the area about 5-10° above average. The epicenter of the heat won't reach this far north, but there will likely be temperatures in the upper 80's and lower 90's to our south and west. In fact, some temperatures on Sunday and Monday could approach 10-20° above average in the Plains and Missouri Valley regions. Warmth looks poised to remain intact through Thursday, but it will be pushed south on both Tuesday and Wednesday. That will cut the lower 80's into upper 70's to perhaps 80° for Tuesday and Wednesday. As a cold front gathers steam in the Plains on Wednesday, southerly flow will again send well-above average temperatures into the Stateline on Thursday. That will again push high temperatures into the lower 80's for much of the area. It will be a very pleasant Thursday afternoon with a lot of sunshine and comfortable warmth in the upper 70's today. And while our Thursday will stay dry, rain arrives early Friday ahead of our next cold front. We will notice mainly rain showers, but can't rule out a few rumbles of thunder through the afternoon on Friday. You'll want to keep the umbrella handy with on and off rain and thunder through out the day. Rain totals will range between about 0.25-0.75", with heavier rain possible to the south. The rain will come to an end late Friday and then the weather pattern turns a bit more quiet. High pressure builds to the south, allowing upper level ridging through central Illinois. This set up keeps rain and storm chances to the outer edge of that high pressure system as energy rotates through that region. The northern jet stays close to the Canadian border, and again will keep most rain and storm chances north of the area. Storms are usually tied to jet placement because energy or disturbances tend to ride along those areas. Looking past Friday, rain and storm chances will be contained to north and southern portions of the United States. Northern jet keeps rain just north of the area in Wisconsin. Besides Friday, our next chance for rain arrives Wednesday, but overall that is just a slight chance. 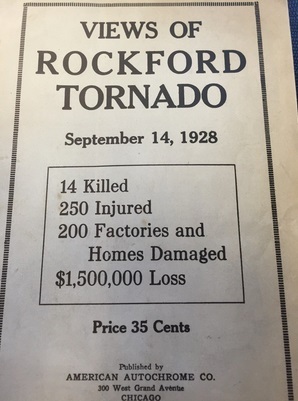 September 14th marks the anniversary of the deadly tornado that tore through southeast Rockford back in 1928 -- 88 years ago. It is a storm that will never be forgotten in the city's history. It developed near the southern city limits of Rockford, which had a population of 85,000 at the time. It moved at roughly 40 MPH to the northeast, affecting the southeastern portion of the city for a distance of 2.25 miles, affecting 30 city blocks. The most noteworthy piece of damage occurred when the tornado barreled into a three-story chair factory in which 114 men were working at 3:22 PM. The building took a direct hit, but only 8 of the factory's employees died. 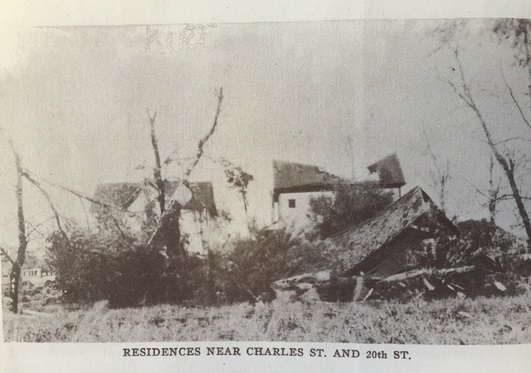 The tornado continued to move northeast, cutting a swath of damage of 300 feet through areas of factories and residencies. Around this time, four teenage boys were quickly walking home to avoid the storm. A garage roof came hurtling through air, instantly killing two of them. A third later died. The storm's path of destruction increased to 400 feet as it shattered windows, ripped apart porches, uprooted numerous trees, and narrowly missed several schools. It did cause considerable damage to other large factories, destroying walls. The tornado moved through a section of new homes, but the damage wasn't extreme. It then moved away from the city and entered an increasingly rural area east of downtown. It still partially demolished several farm buildings and uprooted many trees. The storm moved just north of Argyle, about one mile south of Poplar Grove, and caused some damage in Capron around 4 PM. The length of the twister's path in its entirety was roughly 25 miles. The width of the path reached a maximum of 500 feet. 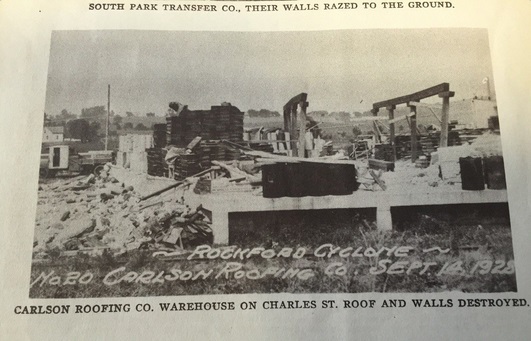 Nearly 200 buildings were damaged or destroyed, and the cost of the damages came out to be about $1.2 million. The tornado was rated an F4 on the Fujita Scale, which suggests winds upwards of 260 MPH. 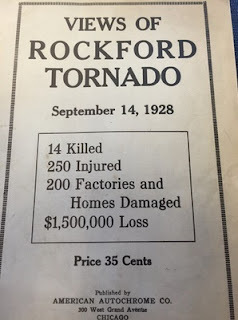 Roughly 100 people were injured in Rockford alone, with fourteen casualties recorded. One thing meteorologists like to do is look ahead beyond the next seven days. Doing so now will provide good news to much of the country if warmer temperatures are what you like. Looking at the long-range forecast models, one thing sticks out more than anything else: no big shots of cold are showing up for northern Illinois and southern Wisconsin. Moreover, there aren't many cold shots showing up for anybody in the United States through the end of September. Now, that doesn't mean there won't be a few short-lived blasts of cooler air. That is to be expected when you transition from one season to the next. What is to be expected is no long-lived cold intrusions through the remainder of the month. The reason for the lack of cold air through the next three weeks is simple: the jet stream will remain along and north of the US-Canada border. The jet stream is an area of stronger winds located well above the Earth's surface. In meteorology, its position makes it easier to determine where colder and warmer air will reside. And, with the jet largely staying well to the north as we round out September, there will be a lack of cold air intrusions in the continental United States! This morning ahead of a cold front, showers and storms are stretching from western Missouri through Iowa and into northwest Illinois and Wisconsin. Areas in Jo Daviess County and Stephenson County, along with Green and Rock Counties in southern Wisconsin all dealing with shower and storm activity. 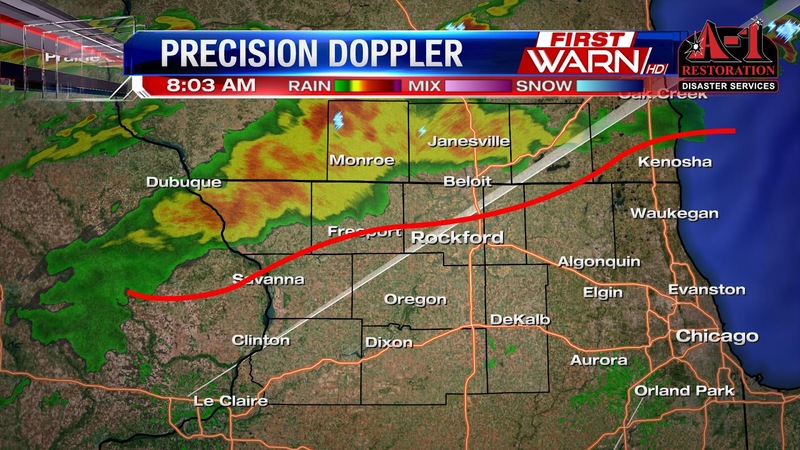 The rain in these areas won't last too much longer this morning, mainly through about 10am and will stay mainly contained along the Wisconsin border and north of a line from Freeport to Rockford. Overall the severe threat in any storms is very low, but tracking small hail potential in the far northwestern corner of Green County in Wisconsin. Also, with dew points in the low 60's along the border, some heavier downpours possible. There will be many dry hours this afternoon, until the cold front passes later in the afternoon. This will allow for a higher coverage in showers and storms closer to the 3/4pm hour. As the cold front passes scattered showers and storms will continue through this evening. The rain comes to an end just after midnight, with a lingering shower possible Wednesday morning. High pressure then builds in behind the cold front and we dry out through Wednesday and Thursday. With fall quickly approaching, many are beginning to plan trips to see the best foliage around. Both Wisconsin and Illinois will see a good showing of color with no significant flooding or dry spells occurring this year. In just a few days, there may even be very minimal changes in Illinois and southern Wisconsin, according to forecasts. Many locations don't see much in the way of color changes until late September and early October. 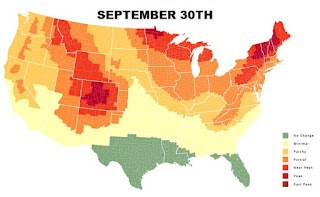 By September 30th, the map looks quite a bit different. Most of Illinois and the southern half of Wisconsin will be in the "partial" category for foliage. This is when some changes will become noticeable as you drive from one location to another in the Stateline. 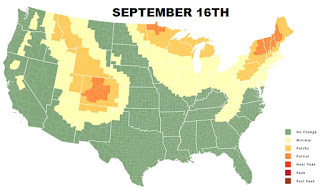 The areas by the last day of September that will see "peak" foliage include the mountains of Colorado, far northern Minnesota, and the mountains of northern New England. Things really start to change as we enter the month of October. By the middle of the month, foliage will be at its peak level in many locations. Some mountainous and far northern areas may be in the "post peak" category by this time. Southern Wisconsin and most of Illinois will be in that desired "peak" category. 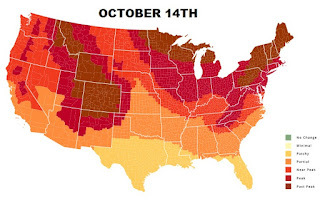 For Wisconsin, peak foliage occurs between October 5th and 14th. For northern Illinois, that occurs between October 5th and 21st. That means it's time to start planning those trips to local parks! After a fantastic weekend in the weather department, our eyes have shifted to the work week, which features two decent chances of rain. One system will move in on Tuesday and bring a threat of showers and a rumble of thunder or two from Tuesday morning through very early Wednesday morning. The severe threat is essentially zero with that system with many severe weather parameters looking minuscule. The rain won't be heavy, nor will it be falling constantly. Our second system rolls in on Friday. That will introduce another rain chance through the day on Friday and into Friday night. Some of the rain may stick around through the first half of Saturday as well with low pressure expected to strengthen to our northeast. As is the case with Tuesday's rain chance, Friday isn't a "for sure" hit with everyone seeing rain. Thunderstorm chances look minimal, as does our chance of seeing heavy rain on Friday. To be safe, though, pack the umbrella on both Tuesday and Friday to stay dry in case a rain shower does move in when you happen to be outside! What a change a couple of days makes? Things have changed dramatically for us in the Stateline area as a strong storm system has ushered in significant changes to our temperatures and humidity. As highlighted by the graphic, our average high over the 7 days prior to today was 85 degrees, and with our forecast for the next 7 days, our average high will fall to 75 degrees! Not only will we feel the temperatures fall, but it will also be much drier outside, as dew points have fallen from the 70's last week to the 50's today. So, if you are tired of constantly running your air conditioner, you will be able to take a nice break. Our weather pattern has changed so that the predominant flow is coming from Canada, ushering in storm systems every 3 to 4 days and the cold fronts that accompany those storms. A possible downside is that you will need a jacket at night as our low temperatures will be in the 50's and possibly the 40's in some areas. Average high temperatures fall quickly this time of year as the days are getting shorter and the overall weather pattern starts to change. Over the next 7 days the average high temperature drops from 78 down to 75 degrees! This is not to say that we won't have some warm days left, but certainly they are going to be less frequent! The coolest air in a long time is poised to move in this weekend. Behind tonight's strong cold front, winds will turn blustery out of the northwest on Saturday. That will do two things. First, it will make for a breezy day. Second, it will keep our high temperatures in the lower 70's under a mostly cloudy sky. That will result in an early October feel, especially early in the day when a few isolated showers are possible. Once the winds subside in the evening and high pressure begins to move in and eat away at our cloud cover, temperatures will be allowed to fall off like a rock. When you want chilly temperatures in the warm months, you must have ideal conditions. Clear skies, light winds, and an area of high pressure combine to support very effective radiational cooling. These components will all be in place Saturday night, which will allow temperatures to fall into the upper 40's in many spots. Some of our forecast models hint at middle 40's, which wouldn't be completely shocking in our typically cooler locations, such as Rochelle, Freeport, and Monroe. 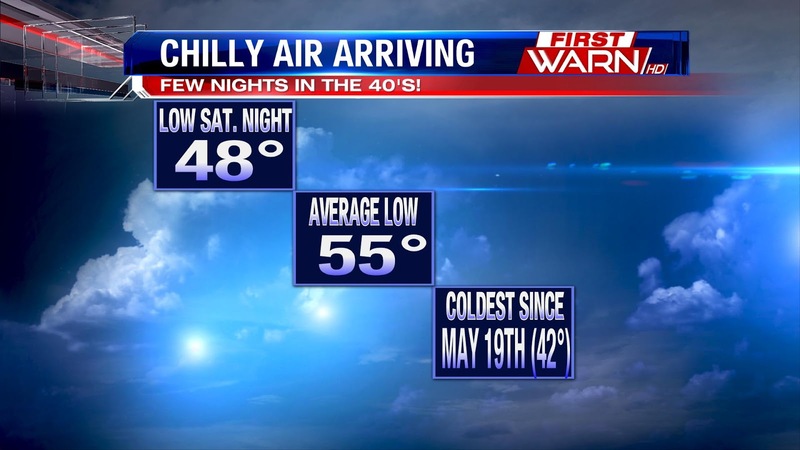 Nonetheless, our average low currently is 55°, and the last time temperatures dropped to 48° or less was back on May 19th! So it'll definitely be an unseasonably cool night for mid-September. Who's ready for a fall-like weekend? If you enjoyed the heat and humidity, you may not like what we have on tap by Saturday. Friday will be quite humid as we see a return to southwesterly winds. That will usher in higher humidity once again, in addition to keeping our temperatures in the lower 80's. As another cold front approaches and an area of low pressure deepens to our west, there is a risk of isolated showers and storms throughout the afternoon. However, Friday evening and Friday night feature a far better chance of rain and storms. Some of the rainfall could be heavy as another unseasonably moist air mass sits over northern Illinois and southern Wisconsin. 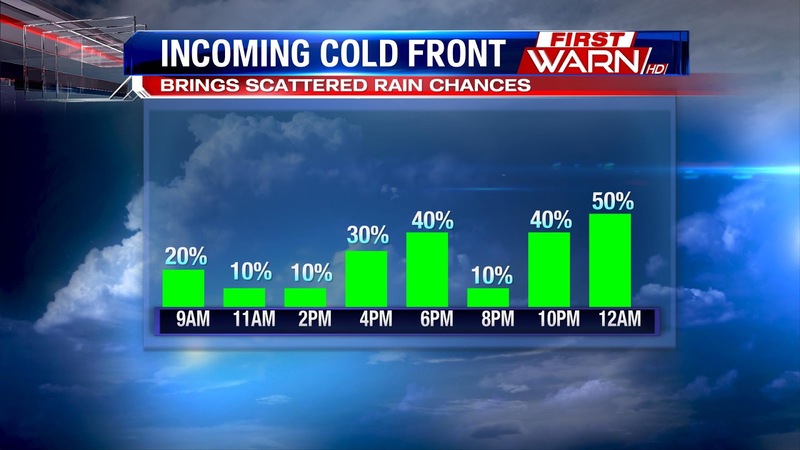 The front passes early Saturday morning, which will keep a threat of showers through lunchtime. As it passes, our winds will turn northwesterly and gust upwards of 20-25 MPH. Those northwesterly winds will usher in much cooler, less humid air. They will also be responsible for keeping mostly cloudy skies in the forecast through the day. In fact, an isolated shower is possible through the afternoon as highs only reach the lower 70's. 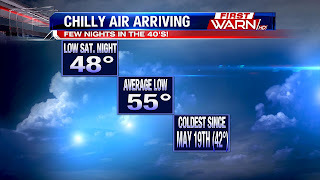 Saturday night could feature the coolest air we've seen since May! Models are suggesting upper 40's as skies clear and winds calm, which would allow very efficient cooling to take place. Sunshine returns Sunday as high pressure builds in, but highs again only reach the lower 70's with cooler winds still in place. All Aboard the Cold Front Express! Probability of Precipitation...What Does it Mean?